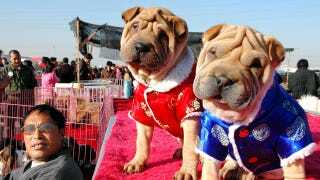 Under a new law in Shanghai, homes will only be allowed one dog each. While in the city of Guangzhou, people have to get rid of their extra dog, Shanghai residents can keep their current pets but must put puppies up for adoption. The government claims it has to crack down on rampant barking, unscooped dog poop, and the increasingly high number of dog attacks, but many residents say these problems could be addressed with education about pet ownership.